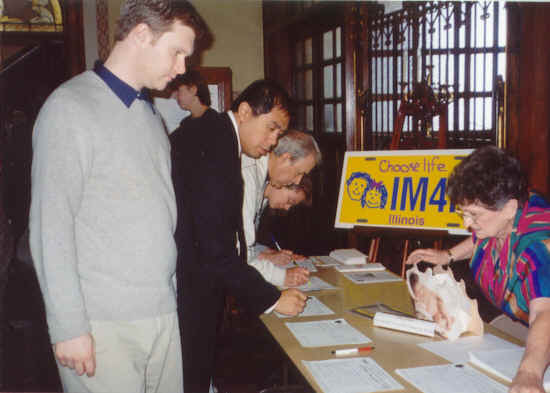 Illinois Choose Life, Inc. has been organized to support the adoption of children in Illinois. Funds generated from Choose Life specialty plates will support adoption. Status Update: The Effort Continues! An earlier appeal to the U.S. Supreme Court was denied in October 2009, allowing the Seventh Circuit Court of Appeals ruling against Choose Life plates to stand, as handed down in November 2008. This result prevents reinstatement of Judge David Coar's decision in favor of Choose Life license plates in Illinois. How will adoption be supported? Funds to both encourage the adoption option and provide support for birth mothers who are considering adoption can be raised through the sale of Choose Life specialty license plates. Successful petition drives to obtain signatures supporting the establishment of Choose Life license plates in Illinois were effective to demonstrate strong support for these plates in our state. The Donaldson Institute and the Dave Thomas Foundation performed a survey showing that Americans have a very favorable impression of adoption. 40% of Americans have considered adoption and 60% have been personally touched by adoption. The number of people seeking to adopt children makes every child a wanted child. Many people involved with adoption are supporting Choose Life plates. Is Illinois Behind Other States? As of December 2016, 33 states have approved Choose Life specialty license plates. Choose Life plates are on the road in 29 of these states, with Florida having the most. The concept of Choose Life license plates originated in Florida, where over 11.042 million dollars have already been raised to support adoption. Choose Life plates are currently being sold in 29 states, with 4 states accepting pre-sale orders. The plates recently became available in North Carolina. Initial approval has occurred in Wisconsin, Utah, Maine and Nebraska so pre-orders for Choose Life plates can be placed in those states, and the plates will become available after the minimum number of orders are received. Wisconsin became the 33rd state to approve Choose Life license plates, with Maine the 32nd, Iowa the 31st state, and Alaska the 30th state. North Carolina was the 29th state to approve the plate, but was delayed in availability until a recent Supreme Court ruling reversed a Federal Appeals Court decision that had blocked distribution of the plates there. The Seventh Circuit Court of Appeals unfavorable ruling has denied the availability of Choose Life plates in Illinois, now that the Supreme Court has declined to review the case. This ruling stands in stark contrast to the Ninth Circuit Court of Appeals ruling in Arizona, as well as the Eighth Circuit Court ruling in Missouri. Efforts to gain approval for Choose Life plates are ongoing in 12 more states, leaving only 5 states with no current effort being made on behalf of Choose Life plates. Check out this web site to learn how you can help make Choose Life plates a reality in Illinois. Why should Illinois be left behind in this visible effort to support adoption? Unfortunately, without a future Supreme Court ruling that would override the Seventh Circuit Court of Appeals unfavorable ruling, or an action of the Illinois Legislature, Choose Life plates cannot currently be authorized in Illinois, but.... The effort in Illinois will continue until Choose Life plates are on the road! Illinois Choose Life, Inc. is an IRS 501(c)(3) organization and donations are tax deductible. 100% of funds received are used to promote the Choose Life License Plate in Illinois. >> Sign and circulate the Choose Life petition form or for greater impact organize a petition drive. >> Let us know you are ready to order the Choose Life license plate if it ever becomes available. Catholic New York Editorial: Put New York Choose Life Plates on Road!